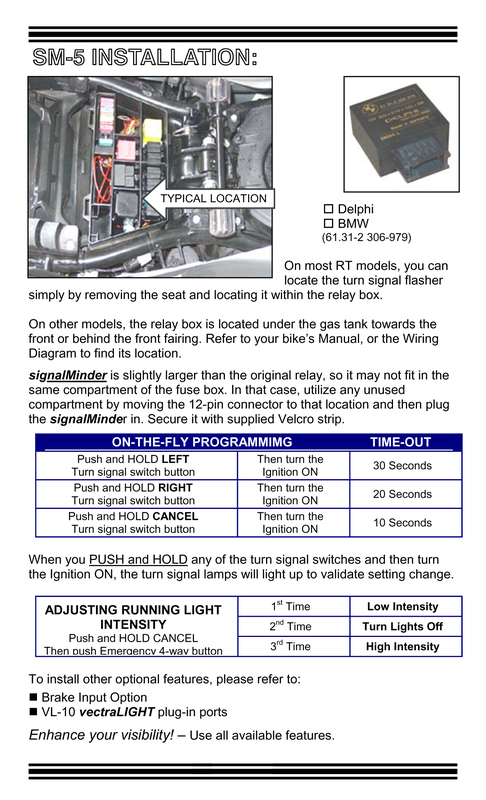 SM-5 unit is designed as a plug-in replacement for most BMW "R" Bikes and some "K" series bikes with dual handlebar mounted turn signal switches. 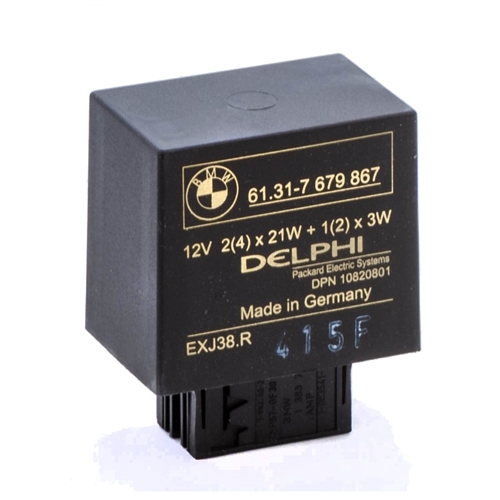 This unit has a matching 12-pin connector and replaces the original Delphi turn signal relay. 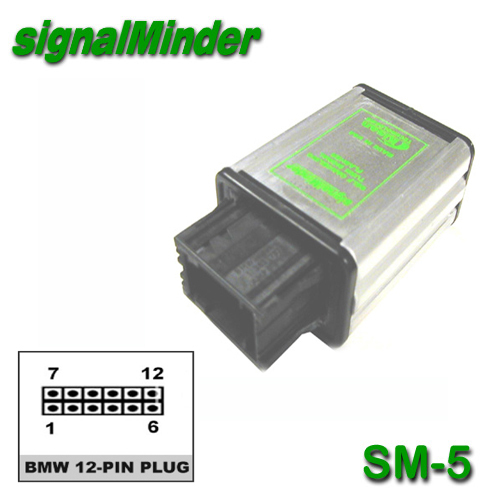 SM-5 operates all four turn signal lamps at reduced intensity to enhance your visibility in the traffic. This conversion is all done internally without any modifications to the wiring. This optional feature can be enabled or disabled on the fly. SM-5 has soft touch configuration. Soft touch configuration allows the timeouts and running light options to be changed on the fly. SM-5 has (3) selectable timouts: 8 seconds, 30 seconds, and 45 seconds. 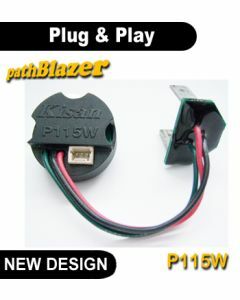 No need to buy other turn signal conversion product. You get all the features of RUN-TURN-BRAKE and automatic signal cancelling! BRAKE FLASH OPTION will flash the turn signal lamps every time you apply brakes. A short 2 second flash pattern begins with quick flashes then slows down to stay on solid. This option can be progarmmed On or Off. If you hold down the turn signal switch, turn signals will flash twice as fast for the first (4) times. This is an excellent feature to get immediate attention while changing lanes. Instead of using your right thumb in that awkward motion to push up the Cancel button, simply push the Same-side button to stop flashing. 4-Way Emergency Flash Push both right and left buttons simultaneously to begin 4-Way flash. To stop, use the right side Cancel button. Please Note! NONE of the wires on the bike have to be cut. 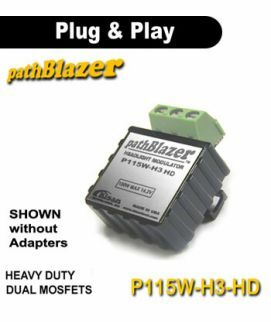 The kit includes Scotchlok brand of Insulation Displacement Connector (IDC) to tap into existing brake wire. No special tools are required for installation. 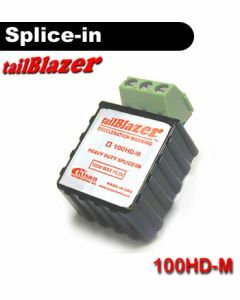 Follow the steps outlined in the Installation Manual included in the product package.